Description: A real plan Jayne work horse in the paddock, but when dressed up she is a real champion. 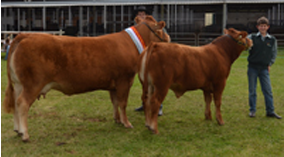 Grand champion senior female, Adelaide 3 years in a row and first outing at Melbourne royal took out reserve champion interbreed senior female. Along with many supreme exhibits in SA and VIC. Structurally perfect with an amazing udder in a moderate 800kg frame. Sire is a trait leader for all growth traits and docility. Her dam is Warrawindi’s leading producer. A producer of outstanding carcase progeny. Description: A cow with huge volume, huge udder, huge docility. Thick as a brick. A very powerful female. Description: A real black beauty. A large framed cow with amazing figures. A dam that will only get better with age. Description: A large framed french pure cow that has lots of class. Out cross genetics. Description: A vibrant young cow with lots of promise. Purchased at Donna Valley dispersal for $11,000.